It is 96 Degrees Fahrenheit outside. I have not missed Colorado since my move to San Francisco, until now. It is one thing to scrape the snow off your truck before the sun rises. It is another thing to curse the actual sun! I have no choice but to stare out the window as if my friends are downstairs playing basketball…and I’m grounded. Between you and I, the air conditioner holds the key to my sanity and I have no choice but to figure a way out of this straight jacket called Summer. I have erected a drawing board on my wall and the dry erase markers are battling for position. I have several lists of cold delicious treats that could help defeat the boiling star that is attacking my day. On one side I have written down drinks that can be mixed with ice. In the middle, a list of fruits that can be united into delicious salad. Wait a minute. What if? Yes! What if I combine the both ? I can easily take any fruit and mix it with ice. Wait one more second. What if I turn the fruit itself into ice…? Oh boy! These mixed frozen drinks are called Granita’s. Originating from Sicily, Granita’s come in many flavors, not just fruity. Chocolate remains a favorite in Italy. With the blazing inferno knocking on my door, there is no time to waist. 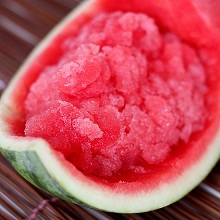 Place half of the watermelon, and half of the sugar into a blender. Process until smooth, then pour into a separate bowl. Repeat with the other half of the ingredients. Combine. Pour this into a 9 x 13 baking dish. Freeze for two hours, then lightly scraping the top, frozen layer. Return the pan to the freezer with the shaved ice on top. Repeat the scraping process until the entire mixture is shaved. Lifted high above my head is this frozen offering to the unforgiving heat. And for just a moment I feel as if the sun is twinkling with admiration for my efforts. Everyone seems to be happy again. That’s until I hear the air conditioner chugging its last breath. I guess it is back to the drawing board!